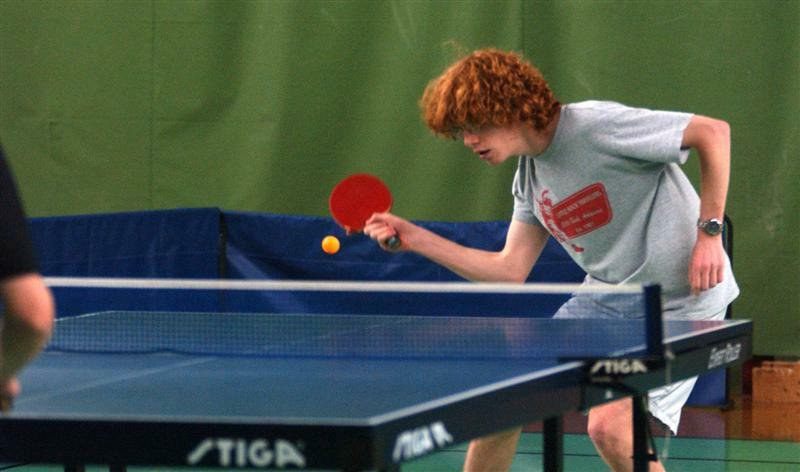 Not unlike Slim Shady himself on his return to the Detroit underground rap wars, Eliasson sliced and diced his way through a quality field on his return at the 2005 GOTHENBURG RACKETLON OPEN. When you think Adamsson, Källberg and Reid have shared 4 of the last 5 tour events (not including Bulgaria, which Magnus successfully defended) the tournament looked fairly open at the semi-final stage. However, what is critical is that it looked open on paper only. Having watched the world champion despatch Christian Wall in the quarter finals 21-13, 21-13, 21-5 in a very impressive fashion, most spectators actually had little doubt that the big fish is back in town ready to gobble up all of his prey. Close followers of Racketlon would have read in the English Open programme that Eliasson's lookalike is Ross Kemp, the startling coincidence is that after a short break from the soap, Grant Mitchell is back which should certainly help the Eastender's ratings. Are they the same person? Are they twin brothers? Who would actually win in a fight? The only remaining question would be if Calum Reid keeps training and improving, is he capable of outlasting the Iron Man? This is forever a possibility and undoubtedly a 20 year old student surely can initiate a training programme to rival a 37 year old psychologist. Time will tell.........Horacio Greatorex the 3rd placed Veteran and probable re-instated world number one outlined his thoughts "You heard it here first, Calum Reid has all the criteria to be a champion". The moosehunter´s comments indeed should be taken seriously and the young Scot could make the world championships in Vienna much, much more than another ticket to the Elia-Elia Show! Remarkable development. To the left, Calum Reid at the 2004 Gothenburg Open, world ranked 11. To the right, Calum Reid at the 2005 Gothenburg Open, world ranked 2. When is he ready for take-over? Nu börjar leken för grodor, paddor och vattensalamandrar ute i naturen! This is stunning news from the Universeum Science Discovery Centre that it is now breeding season in Sweden for frogs, newts and toads. This obviously acted as supreme inspiration for Silke Altmann, who leaped and jumped around the courts showing excellent agility. Silke´s 3rd tour victory after Belgium and England, is the athletic German´s 1st win over Swedish supremo Lilian Druve. There is a poll on the UK Racketlon discussion group ( www.racketlon.co.uk ) about who will be Ladies world number one after Vienna? This is indeed up in the air with the new revelation that Silke is ready to challenge the very, very best. The eye on the ball. Lilian Druve. Still world no.1 but lost to McFadyen in Scotland and now Altmann. Bredberg and Engström bring more glory for Sweden! Michael Appleton succesfully overcame David Greatorex in the Battle of Britain in the men's vets semis. In Appleton's 2nd ever Racketlon tournament (he also holds a victory over Richard Whitehouse) - Mike is a name for the future! Ulf Bredberg was far too strong in the veteran's final for Michael Appleton in the first three sports. Particularly in table tennis and then outlining also very strong badminton. This did not therefore allow the ex-David Cup tennis starlet (Appleton) to play in his strongest sport. Stefan won a very strong Class 1 Event and with Västerås winner Johan Porsborn losing in round one to Kristofer Ziegler alongside Keith Lesser to Andreas Carlsberg and Jukka Salminen to Carl Johan Olsson, with Antilla defeating Niska the list goes on and on! Carl-Johan Olsson has improved a lot in recent months and was a worthy finalist. Carlsberg clinched 3rd place and is one to watch as he is getting squash coaching, playing 4 times a week making only his 3rd sport extremely strong! Very Strong Tennis Players and Everlasting Squash! Indeed it was another shame we did not see Appleton, who also scratched for Rickard Persson in the men's elite, take on Christian Wall in tennis since three sports were enough to decide the match. Wall seemed on fire, until he met Eliasson, and had somehow managed to defeat ex-IRF president Hans Mullamaa 21-1 at squash. The courts were very bouncy and in these conditions, it was seemingly impossible to end the point. Johan Nordstrand outlined the only way to finish the point quickly was to dominate the T, line and length seemingly were not enough to be victorious. Staffan Ericsson (an ex-world championship bronze medalist(!)) outlined his racketlon credentials with a sublime victory against Johan Nordstrand +16 and then an extremely close match with Scotland´s very own Calum Reid. Calum needed 6 points in the tennis and he achieved his goal at 14-6. Calum later admitted he was "relieved" as he got off to a very good start 3-3 and that Ericsson was a very dangerous player. Congratulations to tennis specialist Henrik Axelsson on his amateur victory. Voodoo is a derivative of the world's oldest known religions which have been around in Africa since the beginning of human civilization. This has absolutely nothing to do with the Nowicki element. The Nowicki element does however affect a series of class one/elite players who are unsure of which event to enter. Heinz, for example, may have more fun in the class one, which he still would not have won, but may have progressed beyond a last 16 battering from badminton specialist Mathias Fagertröm. This affects perhaps 20-30 tour regulars. The trick is coming 3rd in a class one event and then getting destroyed by Stefan Adamsson upon your move up to elite. This presents a tricky problem, which I guess can only be solved by the ranking system. If you find yourself in the top 60 in the world, you also find yourself in the elite draw. Otherwise, we may surely all start to be affected by voodoo! Chris Noakes has some further information should anyone wish to discuss further Racketlon profile possibilities. Gothenburg Open Teamwork. Stefan Engström, Patrik Andreasson and general Håkan Granberg at the tournament desk. Calum Reid (Scot) - Stefan Adamsson (Swe) W.O. David Greatorex (Eng) - Kenneth Sjökvist (Swe) W.O.